If you are purchasing a vehicle for the first time, you are eligible for the 1st Time Owners Program. This program allows you to finance a new, or Certified Pre-owned Vehicle, or to lease a new Mazda vehicle with $500 off. 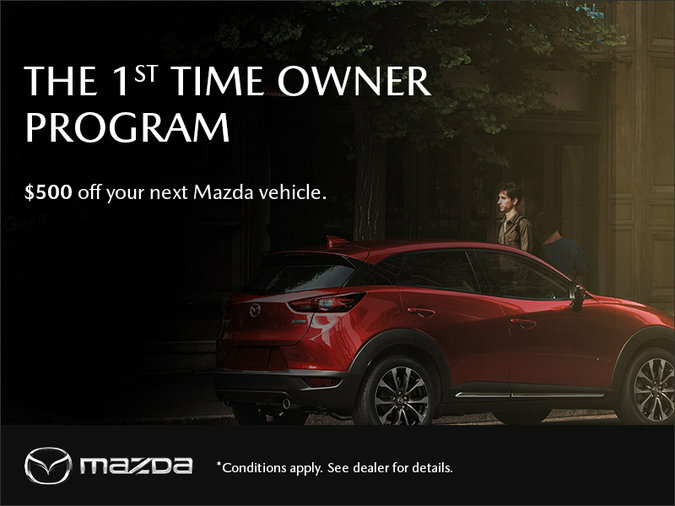 The 1st Time Owner Program applies to new Mazda3 Sport, Mazda6, CX-3, CX-5, CX-9, MX-5 vehicles and only certified pre-owned vehicles. Customers will receive a $500 discount off the purchase of a new Mazda3 Sedan, Mazda3 Sport or CX-3. * Conditions apply. See dealer for details.